Whatever you do, don't call her little. This 13.2-hand originally-wild now-17-year-old mustang mare has already accomplished more than most horses have in their entire careers. Janet Tipton, of Erda, Utah, didn't even pick out the 3-year-old at the Logan wild horse adoption in 1999. The mare who was destined to become Lady Jasmine picked her. "I didn't want a mare - I'd never had a mare before," Janet said. Her husband Cliff had his eye on a different mustang, "but she kept watching at me as I walked around the building." That's how Lady Jasmine, who'd come off the Antelope Valley Herd Management Area near Ely, Nevada, came to be part of the Tipton family. She'd been rounded up about 6 months earlier, and was unbroke. Janet and Cliff started working with her at home, and the first thing they noticed was not her size, but her big attitude: "She was kind of very dominant!" Janet said. "She ran over the top of me the first day I worked with her. Her attitude was like, 'I don't care how big you don't think I am!'" Cliff started her under saddle, which went fairly well, at first. On the third ride, she bucked Cliff off. Twice. "So, we went back to square one with her. We worked on some things, fixed some things that needed fixing." Cliff rode "Ladybug" for a year before Janet started riding her. 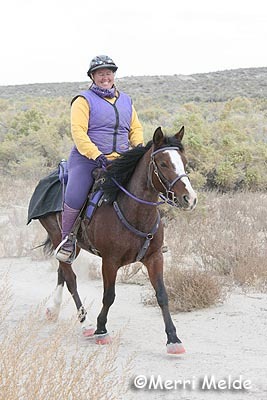 Those two spent a lot of time and a couple of years trail riding, getting to know each other; and meanwhile, Janet had cast her eye on the sport of endurance riding. "I did a ride on a friend's horse in 1999 and was hooked on the sport, but spent the next 5 years reading and studying everything I could get my hands on. And also to build my nerve up." Janet figured Ladybug would have the right attitude for endurance. The pair finally debuted together on the endurance trails at the Strawberry Fields Pioneer ride in April of 2004. They completed the 30 mile ride on Day 1 and the 25 mile ride on Day 3: "We barely finished in time, but Ladybug had all A's" on her vet card." The rest, you can say, is endurance history. 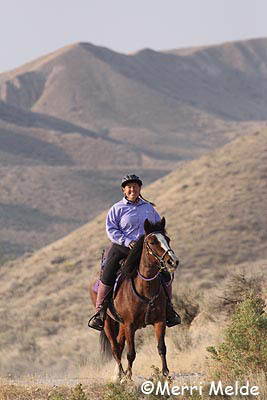 In the October 2013 Moab Canyons endurance ride in Utah, Ladybug became the highest mileage Limited Distance AERC endurance horse ever, with 3985 miles. Her record currently stands at 154 completions in 156 starts (the pulls were a rider option, and an overtime). The pair has done 1 60-mile, and 4 50-mile endurance rides over the years. Since Janet is a heavyweight rider, and Ladybug is not "little," but 13.2 hands, Janet is careful to pick the longer distance rides out for her. Ladybug has about an 8 miles-per-hour average trot. She'll willingly go alone or in company, in front of a group, or in the middle, or behind, though she doesn't love being last. "Everybody knows the last horse will get eaten!" But Ladybug is not only adept at the sport of endurance. 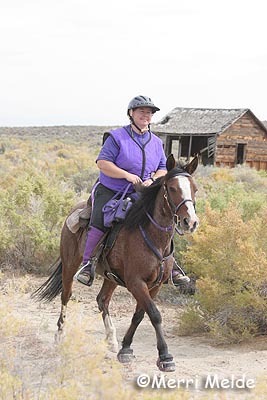 She's also competed and participated in Extreme Cowboy Challenges, dressage, drill teams, and parades; she's been a lesson horse, a pony horse for kids, and she's pulled carts, "though she doesn't like that much. Ladybug LOVES to chase cows too," Janet said. "I have done cattle sorting on her and she is awesome. Always seems to know the cow we are after." The mustang breed has become the centerpiece of the Tiptons' lives. 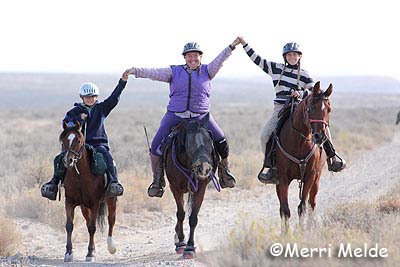 In 2003, the Tiptons formed the IWHBA (Intermountain Wild Horse & Burro Advisors), an adopter support and mentoring non profit for people with mustangs. Over the years the organization has gentled, trained and placed over 200 mustangs and burros. It was all thanks to Ladybug. "Ladybug was our try first mustang and the start of so many wonderful adventures for us. Not just the distance riding trail but in the wonderful people we have met along the way and the amazing places we have visited. She has given and shown us so much that we find ourselves wanting to pass that along. "The ultimate thrill for me is when someone comes up to me at a ride and says they adopted a mustang because of Ladybug. What an ultimate compliment and so very awesome." 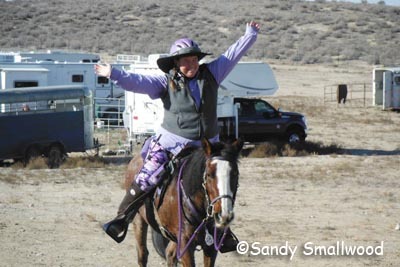 Over her 10 seasons of endurance competition, Ladybug has done rides in Utah, Idaho, South Dakota, Nebraska, Wyoming, Colorado, Arizona, and California. "She tends to do best at multi-days. She just gets stronger every day." 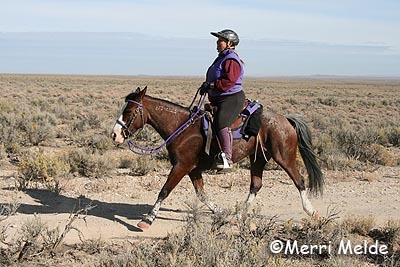 Janet's goal over the coming years with her mustang is to make the Decade Team - riding your horse in an AERC-sanctioned 50 mile+ endurance ride for at least ten ride seasons. This big-hearted mustang with the Big Attitude will surely accomplish just that. RIDE ON! You are an inspiration to all! Such an inspiration and a wonderful ambassador for the BLM mustang!